What Effects Does Oil Drilling Have on the Ocean? Before the connection was made that what you dump on the ground ends up in drinking water, used motor oil was commonly poured on the ground, dumped down storm drains or discarding in household trash. When petroleum products began showing up in drinking water, laws were enacted to stop these practices and to protect public health. 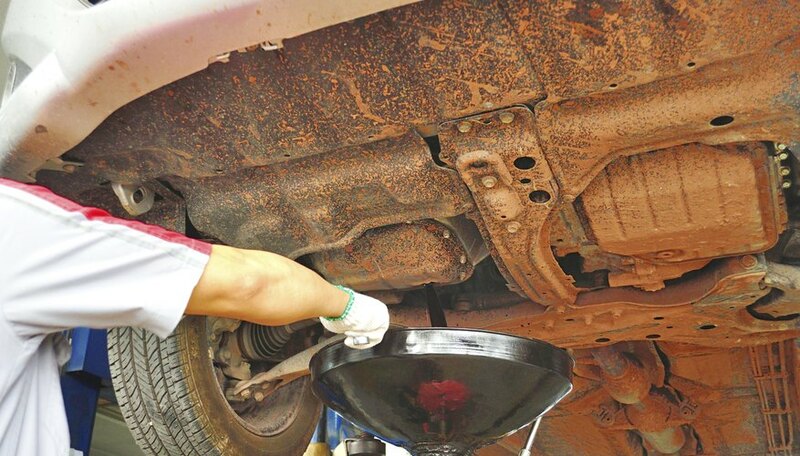 By properly disposing of used or unused motor oil, you can protect the environment from pollution. Disposal laws can vary by state, so check with your community’s household hazardous waste collection center. Proper oil disposal starts with putting the oil in the right container. If you just want to get rid of a few half-used quarts of motor oil you no longer need, you can transport them in the containers they came in. Make sure the lids are on tightly, as this can prevent leakage. If you’ve just changed the oil in your lawnmower, place the used oil in a rigid plastic container with a snug-fitting lid, such as a 1-gallon water jug. Don’t use containers that previously held chemicals, antifreeze or paint. Residue from these products contaminates the oil, making it so it cannot be recycled into new product. To prevent spillage onto the ground, use a funnel when transferring the oil. Label the container. If you like to change the motor oil in your car, you’ll also need to dispose of oil in the filter along with the filter itself. You can drain oil from the filter by placing it in a clean, large plastic bucket, or similar container, with the hole side down. Allow the filter to drain for at least two hours to remove most of the oil. When you're done, place the filter in a leak-proof zip-style plastic bag for transport, and pour the oil from the bucket into a plastic jug with a tight-fitting lid. Don’t rinse oil residue in the bucket onto the ground or down a drain. Instead, designate a bucket just for draining filters. Motor oil that is being transported in your car to a recycling center is not considered a hazardous waste under federal regulations; however, some states do consider it a hazardous waste. Even those states may allow "do-it-yourselfer" to transport used motor oil in small quantities in a car -- as long as it’s bound for a recycling center. Oil in closed containers has the potential to contaminate waterways if the vehicle it’s carried in has an accident near a river or lake. One gallon of motor oil can contaminate 1 million gallons of water. It takes 42 gallons of crude oil to make 2.5 quarts of new motor oil, but only one gallon of recycled motor oil to make 2.5 quarts of clean, usable oil. That’s why taking your motor oil to a collection center for disposal is beneficial when it comes to offsetting energy costs. Many communities offer disposal for free at collection centers, as do auto part stores and automotive repair shops. If you have trouble locating one, call your county’s recycling program for help. K., Diana. "How to Dispose of Motor Oil." Sciencing, https://sciencing.com/dispose-motor-oil-2282844.html. 24 April 2017.